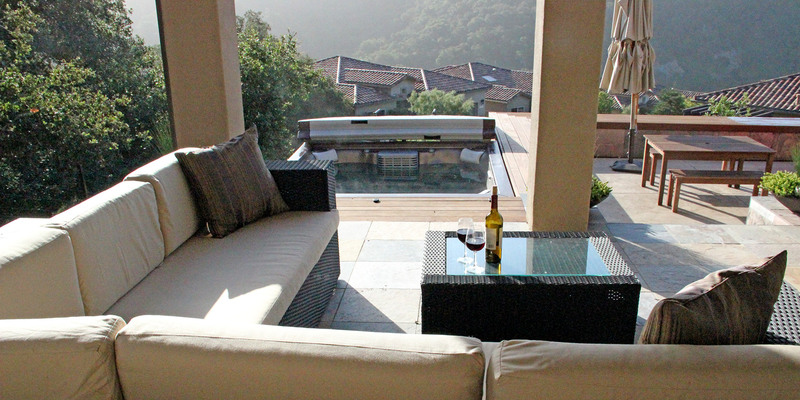 A lot of our clients come to us with a goal of expanding their indoor living space into the outdoors. We think this is a wonderful goal, as it gives our clients more space to enjoy our wonderful Central Coast weather. The main way to achieve this goal is through the addition of hardscape. ‘Hardscape’ is a term well known in the landscape construction industry, but that you may not have run into before. Hardscape refers to non-living elements that are part of our landscapes, such as natural stone, concrete, wood, and metal. Hardscaping is usually what gives an outdoor space dimension. If we think of our outdoor space like a room, a patio would be the floor, retaining walls, screens, or wooden posts may be the ‘walls’, and pergolas can offer a ceiling of sorts. Hardscape is a complementary piece to softscape, or the living portions of your landscaping like lawn, trees, and shrubs. Softscape can also give a space dimension, for example, a trees branches hanging over a patio may help the space feel enclosed, but hardscape elements tend to feel more structured and permanent. Hardscape is an important piece of your landscaping, and we will usually start a landscape design with the placement of key hardscape elements to make meaningful connections between spaces. 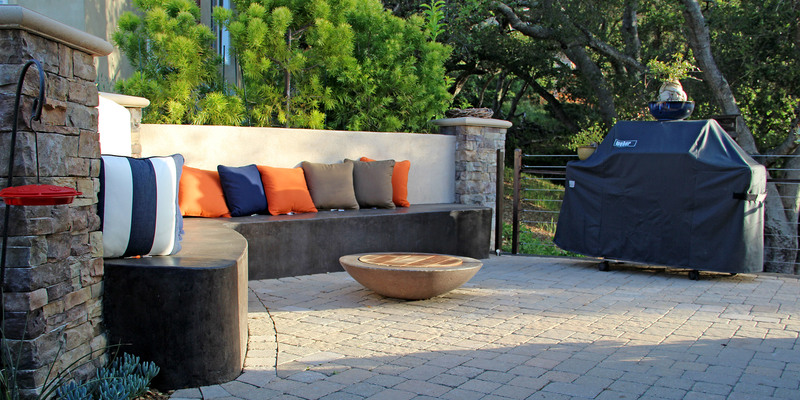 Let’s take a look at some of the options you have to consider when building an outdoor living area. Patios are arguably the most common and important hardscape element. Patios give space for outdoor furniture, whether it be a dining table for your family to gather on summer nights or a few lounge chairs to catch some sun, barbeques or outdoor kitchens with a bar to take the party outside, or room for kids to perform backyard plays on. The size of a patio should be determined by how the owner plans to use it. A patio for a café set that you can enjoy your morning coffee at doesn’t need to as large as a patio that you’d like to host a dinner for eight on. Material choice is a personal preference based on aesthetic and use. A natural flagstone patio can have a softer appearance than concrete, but it is not the most even surface for outdoor furniture or an inflatable kiddie pool that you pull out for the hottest days and don’t want popped. Retaining walls are definitely an investment, but on sloped properties they are often necessary for structural integrity of the site or to increase usable space. 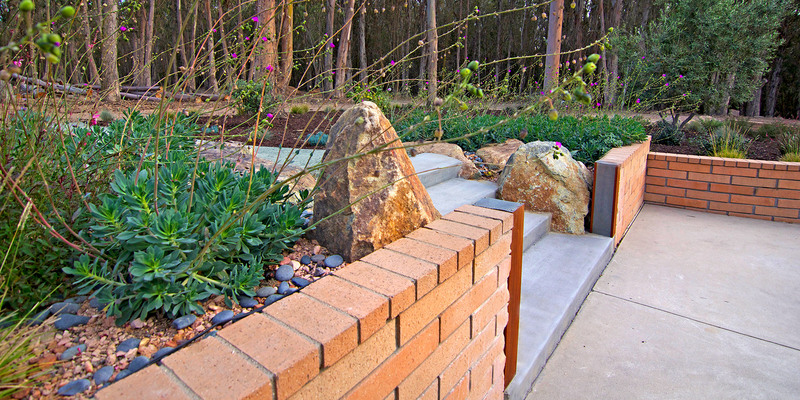 It’s all in the name here; retaining walls hold back soil and allow for level ground or softer slopes. Retaining walls can be built out of many different materials, which should be chosen for the longevity and design intent. Some of the most popular options are poured-in-place concrete, concrete blocks (manufactured to be mortared or mortarless interlocking wall systems), wood, gabion, and natural stacked stone or boulders. Most of these materials can be used on retaining walls of all sizes with the proper footing and reinforcement. As a licensed landscape contractor, we only design retaining walls with a height of 4’ or less (including footing); anything beyond this would require the expertise of an engineer to properly calculate the walls’ load bearings. There are different ways to form retaining walls to offset the reactive pressure of the earth from the gravity of the wall to create a stable wall. These include gravity walls, piling walls, cantilever walls, and anchor walls. Your designer and engineer can explain the best options for your site based on soil type, wall material, and the height of the retaining wall or amount of slope being retained.